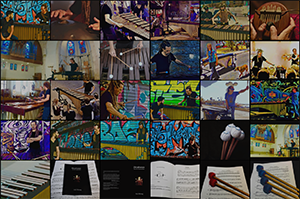 “Through out my career as a marimba player, I have felt that the marimba reaches out for rather small audiences, although it has a magical sound and a very appealing look. One day, I took my marimba to the streets and played it. For most of the people it was the first time they have ever seen a marimba played live. I have learned that in order to present the instrument in the most effective way, I have to choose songs that people know and love. Since then, I have been arranging many famous popular covers and playing them on the streets of Tel Aviv”. Adi Morag, percussionist, composer and teacher, was born in Israel 1976. In 1996 Morag established PercaDu, a world class percussion duo together with Tomer Yariv. As a member of PercaDu, Adi Morag has played as a soloist with leading orchestras such as: New York Philharmonic Orchestra, Israel Philharmonic Orchestra, Los Angeles Philharmonic Orchestra, Munich Bavarian State Orchestra, Tel Aviv Soloists Ensemble under the baton of celebrated conductors such as Maestro Zubin Mehta, Maestro Pierre Boulez, Marin Alsop and more. Adi Morag performed in festivals such as Verbier Festival, Israel Festival (three times), Reykjavik Arts Festival, TIPC Festival in Taiwan, Kaunass Jazz Festival, Red Sea Jazz Festival, Introvert Music Festival and more. Adi Morag has also conducted master classes in universities around the world including Julliard School of Music, N.Y.